It's just not a fun time to be a short-seller right now. Financial markets worldwide are imploding, and more and more people are pointing their fingers of blame at one source: short-sellers. In the eyes of many, short-sellers are the primary reason for the worldwide collapse, and that a permanent ban on short-selling would allow all of the mismanaged and dangerously leveraged companies to soar in value. The Church of England (which currently has about $10 billion dollars in total assets) launched a surprising attack on short-sellers and debt traders, calling them "bank robbers and "asset strippers." First off, Rowan Williams, archbishop of Canterbury and head of the Anglican church, said that banning short-selling was the right thing to do (ok, not a big deal). But then John Sentamu, archbishop of York, continued the attack, calling short-sellers "bank robbers and asset strippers." 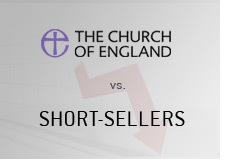 -sold a 135 million pound mortgage portfolio even though they are against "debt traders"
This most recent attack by the Church of England just continues the withering attack that has been launched against short-sellers over the past few months. As any short-seller would point out, they wouldn't have shorted any of these companies in the first place if there weren't serious problems to begin with. Short-sellers typically do not short companies that are well-run and have strong balance sheets. Let's not forget that short-sellers were the first to uncover some of the biggest scams in the history of the stock market (including Enron). Short-sellers are clearly the scapegoats right now - forget about companies that are shamelessly mismanaged. Forget about companies that were dangerously leveraged. Forget about companies that plunder company resources just to enrich those in upper management. Let's just ban short-selling and all of these problems will go away. Right.